Why are representative democracies extensively criticised, yet remain widely aspired to throughout the world? Many citizens believe that democratic politicians operate with privileged information that allows them autonomy from genuine democratic controls, a phenomenon reinforced by the opacity of internal party politics. In established democracies throughout the world there is a widespread perception that political parties compete for power, yet no significant differences exist between them. Moreover, economic inequalities are no longer redressed by national governments in a world where markets are dominant and relevant decisions have been taken out of domestic politics. Citizens vote, but their choice is hardly relevant. This has led to widespread demands for 'more' democracy. But what does that mean in practice? Can democracies introduce greater 'representation' of citizens' interests? Do politicians operate as an autonomous caste hardly challenged by voters? Has political competition become irrelevant for the welfare of people? Do citizens want more democracy in internal party politics? And turning beyond the nation-state, has the European Union changed the scope of policy alternatives and influenced the accountability of politicians? What have been the consequences of European integration for national democracies? In his major new book, José María Maravall examines these and many other questions fundamental to democratic politics in the 21st Century. 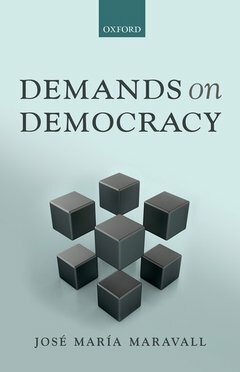 In doing so he draws extensively on original empirical evidence from 21 OECD parliamentary democracies from 1945 to 2010, and 1,259 country/year observations focused on politics, representation, parties, inequality, economic policies, and the political and economic conditions of European integration. José Maria Maravall was, until his retirement in 2008, Director of the Juan March Institute in Madrid. He has held Visiting Professorships at NYU, Harvard, Columbia, and the EUI, and is an Honorary Fellow of St Antony's College, Oxford and the British Academy. Between 1982 and 1988 he served as a Cabinet Minister in the Spanish government of Felipe González. His books include Regimes, Politics, and Markets (OUP, 1997) and Democracy and the Rule of Law (co-editor with A. Przeworski, CUP, 2003).